Joy helped as I rushed to meet the deadline for call for entries at The Art Center of Corpus Christi for their Independents show. This one is called ‘Hina’s Garden’. If you are interested Google ‘Hina’ and ‘Na Maka O Ka hai‘. She is an Hawaiian Goddess of coral and spiny creatures although she spends much of her time on the Moon. It is about 5 1/2 feet high and about the same wide. I like the notion of returning to reverence to gods and goddesses of natural things, learning the myths of the past when nature was all people had to base their beliefs on. Joy entered her needlepoint ‘King of the Hill’. 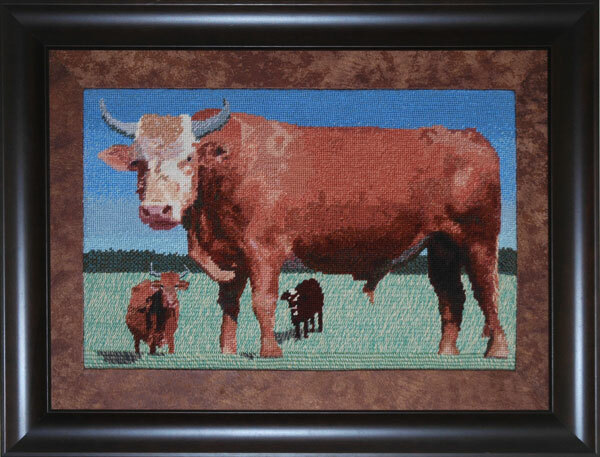 This was done from an early photo taken by Joy of a family bull named Butterscotch and a few cows. We talked about how most art is viewed without appreciation of what went into it. We are guilty of the same. 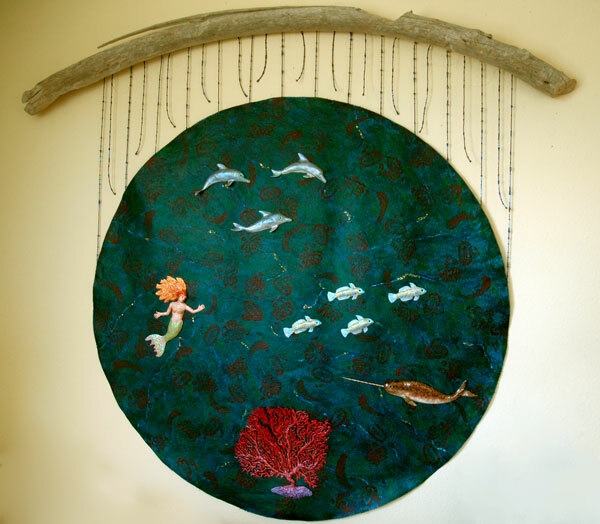 She actually worked a long time on this piece and went to great lengths to find just the right color yarn. None of it is dyed. I have to put aside sporadic little feelings that art is a big waste of time. Everything in life seems to have two sides. You just ignore the one you don’t favor. We actually very much like working on these projects. I just viewed your new entries. They are as always all beautiful, all inspiring and all original. I am so anxious to hear how they do. I feel these will bring much talk and appreciation. Joy, you did such a beautiful job on your entry. I know you spent many hours doing this piece. It is really what some will call “as perfect as you can get”. Steve, your piece is the perfect piece for getting the viewer to appreciate the meaning. I really love your work very much.